When I first heard about the journal we were supposed to have for this class, I was slightly psyched and slightly apprehensive. I've kept diaries before, but I never had a journal for a class. During middle and high school, all of my English teachers were more focused on grammar and structuring our writing, instead of letting our creativity flow. I was curious to see what the journal experience would be like. I have to be honest here, my favorite part about the journal was decorating it. I can't paint, I don't know how to draw, but I adore making collages. I love how the colors just fit in randomly, there's really no order, no structure. It just flows. I had fun picking out the images for my journal cover. All of them a special meaning. The covers are not divided by categories; all the images are scattered. The front cover of my journal reflects mostly what the back cover does: places I've been to (the Roman Colosseum, Vatican Square), places I am dying to visit (Paris, France) and little quotes of wisdom I find are essential to any tourist or traveler. The first quote I picked, which is coincidentially the subhead for this blog says "Who lives sees, but who travels sees more." This quote really stood out to me because I realized that the more you travel, the more you grow. The more insight you acquire, the more you learn about yourself and about the world around you. It's not that you have to travel far away - you can travel from here to the next block and be able to say "Hey, I just went on a journey." What it means it's that wherever you travel, have the capacity to see the world with new eyes, and a diffrerent perspective. The second quote I posted on the journal was the definition of wanderlust, which states it as a desire to travel, to understand one's very existence. I can say for sure that everyone who travels has at least a little bit of wanderlust in them. 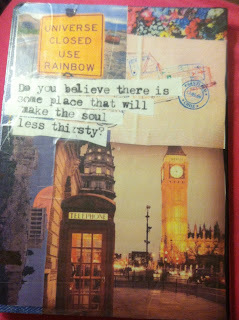 The back cover of my journal also shows places that I want to go to (the Parthenon ruins in Athens, the Big Ben in London) and has another quote that I love: "Do you believe there is a place that will make the soul less thirsty?" This quote really spoke to me. I am a sucker for astrology, and though I don't believe in daily horoscopes, I do believe every star sign has certain characteristics that define the people born under each House. I'm a Saggitarius, which is a fire sign, and is known for looking for the philosophical meaning behind their lives while traveling. This is very personal of course, but I always feel that there is more to learn. No matter how silly, the mind enriches itself with new information. In the future, I hope to find a place where I finally feel free, creative and full. Whenever I think of this place that will make my "soul less thirsty" I think of France. I've never been there, but something tells me it's where I belong. I apologize for this little anecdote, but it's the only way I thought of to explain my journal properly. I love how my journal is full of color and wonder, it reflects who I am. I enjoyed writing in it this semester, and I feel like my writing has been flowing better ever since we started the journal exercise in class.